Are Model X buyers still "Early Adopters"? Discussion in 'Model X' started by SCModelX, Dec 4, 2015. Yes, my mind remains boggled that there is no alternate finish option. Yes, I am hoping if we all complain enough they will offer the early adopters ('cause ain't NO way those are gonna be on the X forever) a wrap of a matte leatherette type stuff.. like on my X5. Anyone listening from headquarters?!?!? Your screenname notwithstanding, you think X reservation holders are early adopters? I consider the first Roadster owners to hold that distinction - putting money down on unproven technology. 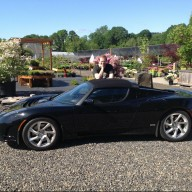 Even though I have a Roadster, I bought it after Tesla had a bit of a track record, was delivering cars, and was public. So at best, I'm late to the 'early adopter' party. I consider the early Roadster owners to be the true trail blazers here. Tesla has been manufacturing the Model S for a few years. The X will have lots of neat things, but try as I might, I don't feel like it's an early adopter thing anymore. I think we've passed that line. Your screenname notwithstanding, you think X reservation holders are early adopters? I think they're early adopters of the MX, but overall I agree with what you're saying. I have an early 2014 MS and I've never considered myself an early adopter of Tesla. But there were a lot of MSs on the road, and the reviews were out saying how great it was. I wasn't taking any serious risks buying the vehicle. Buying the MX is slightly different, especially with the way it's being rolled out. The early buyers are taking a bigger leap of faith than I was two years ago. The vehicle has barely been seen, there are no drive events (yet), and the reliability of some of the nifty features is up in the air. I love my MS and I love Tesla, but their track record on early vehicles isn't great. That could change with the MX, but since people confirming today don't know, I'd call them some flavor of early adopter. Roadster owners were pioneers, or "innovators" by the Rogers technology curve. First Model S owners were as well. First long range electric sedan from a first time automotive manufacturer. Few Superchargers. Plenty of unknowns, and far from mass awareness, let alone mass adoption. Your Model S buyer today is still squarely in the early adopter phase. Model X is further along the curve, I agree, but there are still many firsts and unknowns. Yes, I'd say anyone who buys a Model X is an early adopter. And I would thank every one of them personally if I could. We're a _long_ way off from mass adoption. Arguably that will finally change with Model 3...but after several years. Hmmm, having watched membership change on this forum, I'd put current buyers in the 'early majority' space. Hard to call people 'early adopters' when they're upset over some of the things I see complaints about these days...you know the posts I mean. They typically start with 'when I pay this much $$ for a car, I expect [fill in the blank]. That's not early adopter language. But y'know, it doesn't really matter. I don't think of myself as an early adopter, you do. And no one has to be right or wrong. Yeah, we're definitely starting to see some of that creep up I totally agree, but I'd argue it's a teeny tiny minority. A vocal minority, that's for sure, but far from your typical Model S buyer still. Thank goodness. Give it a few more years though and... ick. One of my favorites is a person who suffered TWO flat tires at ONCE due or pot hole complaining that for car that costs this much it should have a spare tire. Yes, it's an interesting system of categorization and labelling. My take on it is: EV buyers on the whole are generally still early adopters/pioneers, but many Model S (and X?) buyers are already early majority/aspirers/followers. Remember, the Model S has been the top-selling premium sedan in the US, even surpassing the iconic Mercedes S-Class, and it nearly is in Europe, home of Mercedes & BMW. I think that squarely puts new buyers in one of these latter categories. Tesla vehicles still account for just a small portion of the overall car market, and EVs as a whole as well of course, but that's largely a matter of price -- not many people can afford a $70,000+ car. If all EVs were dominating their segments/classes like the Model S is dominating the premium sedan class, the EV market would be many times larger than it is today. But various things need to happen for that to occur (low-priced + long-range EVs need to be widely available; arguably, they need to have Supercharging access; and awareness levels need to rise a great deal, even for Tesla). Good luck finding any "early majority" buyers who have the LEAF or i3, but I definitely think a good portion of Tesla buyers now fit into this category. Here is how I look at it, we still have a company that is trying to do something that has not been done since Henry Ford and it is still not set in stone that it can and will survive. Buyers that purchase today may not be early adopters but still are risking the possibility that Tesla could fail. It is not like buying a car from Ford or Mercedes, so in my estimation we are forward thinkers and supporters of this company. So early adopters could still be an appropriate term. I Think Roadster buyers were innovators and current Model S and X buyers are early adopters. Can we back to pictures of Model X, please? I believe that the Roadster owners fall in the Innovator phase, the Model S owners in the Early Adopters and the Model X in the Early Majority ... don't be a Laggard. First Model S owners were as well. First long range electric sedan from a first time automotive manufacturer. Few Superchargers. Plenty of unknowns, and far from mass awareness, let alone mass adoption. Model X is further along the curve, I agree, but there are still many firsts and unknowns. Yes, I'd say anyone who buys a Model X is an early adopter. And I would thank every one of them personally if I could. I have to be a laggard for financial reasons. Actually, I can't wait until a fully loaded X-90D depreciates to $15K or so (the PDL will probably still be $35K), in about 10-15 years. Everyone will say "just get a model 3 or Toyota RAV5" and I'll say "uhhh, no thank you, I'd like to be able to stand up once the ride is over, plus I want the good air filter". Well, by that reasoning, I might actually get a Mercedes S550 with Magic Body Control, but idk ... I'm tired of supporting oil wars and religious extremists, and breathing toxic chemicals. Which poison do I choose: crippling or toxic death? I believe the better question, and the point ZachShahan was making above (and that I agree with), is that it isn't a question of whether Tesla is at 15% of the EV market - that's the wrong market to use. I believe the correct market for assessing adoption of Model S is the large luxury sedan market, and in that market, I believe that Model S is now the best selling in that segment. Whether it's 1/6th of the worldwide market or not, it's clearly past that threshold in some markets. From that point of view, I tend to view current Model S buyers as being Early Majority. One reason this is more than simply a question of semantics, is that not only does the addressable market grow in size as you move from Early Adopters to Early Majority, the issues that are important to the Early Majority shifts relative to what's important for the Early Adopters. There is a small bit of the difference addressed here: Crossing the Chasm - Wikipedia, the free encyclopedia, and can be wrapped up as the difference between marketing to visionaries (Innovators and Early Adopters) and pragmatists (Early Majority on out). Things that were optional in the beginning (like say, high speed charging in a reliable network for road trips), become essential for continued adoption. My own stance is that Model X adopters for the next year or so are more Early Adopters than they are Early Majority. But that feels squishie to me, and really, an effective marketing strategy for Model X will need to hold appeal for the visionaries (anybody with a multi-year deposit for the car qualifies in my book) AND appeal to the pragmatists. If Model X is only appealing to the visionaries, then it'll sell well for the first few 10's of thousands, and then hit resistance. I don't see an issue here - the appeal for visionaries seems obvious to me - first EV with towing, falcon wing doors, EV SUV; lots of firsts here. I think that the only company that understands how to build and market EVs to the Early Majority is Tesla. So keep doing what they're doing and they'll be able to address that market also with Model X.